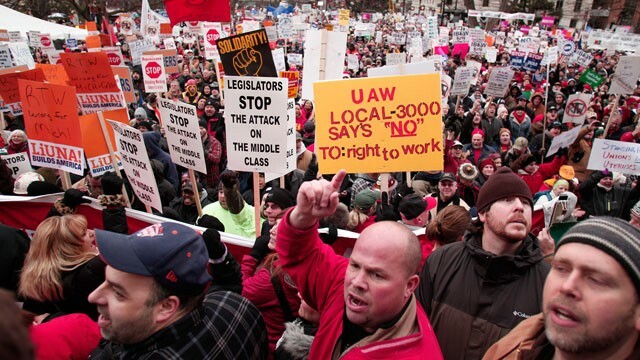 Michigan Governor Rick Snyder blamed the unions when he signed legislation designed to devastate them. He said that he had no intention of pursuing “right to work” legislation in his state, because it would be controversial and divisive. The last few days have shown that he is certainly right about the latter claim. As a lame duck legislature rushed to pass right to work legislation before the newly elected Democratic state representatives and senators could take office, organized labor led massive crowds to Lansing, where they descended on the Capitol Building (at right). It’s almost reminiscent of the long protests in Madison, Wisconsin in 2011. The sequence of events is a little different, however, and it tells us something about the politics of provocation. In Madison, newly elected governor Scott Walker rushed anti-labor legislation through his state legislature at the beginning of a new term. He hadn’t campaigned on the issue, but it certainly fit the conservative profile he had crafted over his political career. Activists crowded into Madison, demonstrating, picketing, and bringing national attention to the issue. After the legislation was passed, activists targeted Governor Walker and Republican senators for recall; most (but not all) survived expensive and divisive elections. Wisconsin voted overwhelmingly for Barack Obama’s reelection, and elected a liberal, Tammy Baldwin, to the US Senate. In Michigan, labor activists tried to take advantage of the 2012 election by enshrining collective bargaining in the state constitution. Question 2 was defeated by more than 15 points, in an election where Barack Obama carried Michigan easily and all six ballot questions were rejected by the voters. It was fairly easy for Governor Snyder and his allies to read the election: Republicans had lost seats in both houses of the state legislature, but organized labor had failed at the ballot box…by a lot. Republicans may have ideological reasons for supporting right to work legislation, but it’s very clear that this was a political move. The new legislation will make it harder for organized labor to organize, to raise money, and to participate in politics. It was an assault on their political opponents that should provide advantages over the long haul. Unless it doesn’t. Social movements respond to provocation. 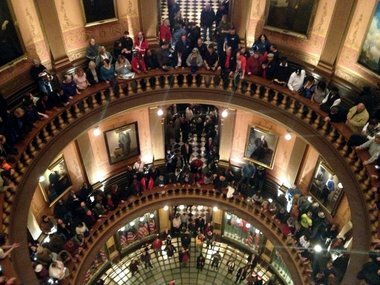 The crowds that turned out in Lansing were incensed by the threat to their welfare (workers earn less money in right to work states) and their political viability. They responded with a vigor that reflected the magnitude of this threat. Americans for Prosperity, the conservative group backed by the Koch Brothers, was also in Lansing, on the lawn in front of the Capitol; confrontations were predictable. The AFP tent was torn down, and there was at least one fist fight (above). All over the web are videos of the confrontations, many with narration and editing that emphasizes the coarse character of one side or the other. Organized labor will try to use Governor Snyder as a target for their ire, and will seek other ways to combat the legislation, and to wage a much larger battle about the future of America. Has a sleeping giant been awakened? or Has a terminal patient been annoyed? Efforts to weaken labor in Wisconsin and Michigan were part of a larger national conservative agenda, backed by groups like ALEC and Americans for Prosperity. Activists attempts at fighting back have generated mixed results. In Wisconsin, Scott Walker kept his office, and severely weakened collective bargaining remains, but the Democrats have done well at the polls. In Ohio, citizens overturned anti-labor initiatives at the ballot box; in Indiana, right to work legislation sailed through state government without much visible opposition. What we know at this point is that neither side is close to giving up. This entry was posted in Uncategorized and tagged ALEC, Americans for Prosperity, countermovements, Indiana, Koch Brothers, labor, Michigan, Ohio, recall elections, referendum, Rick Snyder, right to work, Scott Walker, unions, Wisconsin. Bookmark the permalink.